Did Saddam Hussein Buy 3,000 Chinese Tanks? Sensing an opportunity to end a drawn out territorial dispute, in September 1980 Iraq’s brutal dictator launched an invasion of Iran. But the effort bogged down in less than a year and nearly a decade of attrition on land, sea, and air followed. With Iranian forces sometimes less than a hundred kilometers from Baghdad, Saddam Hussein spared no expense equipping his army with the latest weapons an oil-rich Arab state could buy. Although a strategic nincompoop with little grasp of tactics, several countries were more than willing to build his war machine, with unfailing generosity shown by the Soviet Union, France, and Brazil. But at the height of the Iran-Iraq War it may have been Communist China who benefited from a gargantuan arms deal the world has forgotten. With a thousand British and US-made main battle tanks, 200 AH-1J Cobra attack helicopters, and ample stocks of RPG-7 anti-tank rocket launchers, the Iranian Artesh and the Islamic Revolutionary Guard knocked out so much Iraqi armor it caused serious equipment shortages. Before the war, Baghdad had amassed 2,000 tanks supplied by the Soviet Union and these were augmented by hundreds of Brazilian and French armored cars like the ERC-90 and the EE-9 Cascavel. By 1981 Iraq was well on its way to becoming the world’s largest arms importer and when the Soviet Union and the Warsaw Pact couldn’t deliver enough T-55 and T-62 medium tanks, alternatives were explored. SIPRI’s data on Iraqi arms purchases did leave a “comment” for the entries listing Chinese tanks. The Type 69’s in particular were an initial batch for “1,000-2,000 ordered in the early 1980s.” If this suggested SIPRI’s tabulation had a significant margin of error–many entries have similar speculative comments too–then Iraq paid for an entire tank fleet on a whim. China also supplied 750 YW 531 armored personnel carriers; several hundred 130mm howitzers; a quartet of H-6D bombers; and dozens of F-7 fighter jets transited via Egypt. But China’s generosity to Saddam was opportunistic rather than diplomatic. While Iraqi money ballooned foreign exchange earnings of state-owned enterprises such as Norinco, a healthy trade with Iran was also pursued that replenished its missiles, rockets, and tanks. The preference for Chinese armor did turn out a poor investment as these vehicles were outmatched in every aspect by American, British, and French armor in Kuwait. Readers are no doubt aware the Iraqi army possessed the vaunted T-72M and these second-generation tanks posed a serious threat to the US-led Coalition as it mobilized in Saudi Arabia. Yet according to SIPRI, Iraq was only able to acquire less than a thousand of these from the Soviet Union. There’s scarce evidence a state-owned factory assembled copies known as the “Assad Babil.” Another document, this time from the Center for Strategic and International Studies (CSIS), gives a clearer picture of Iraq’s armored strength during and after the war against Iran. In Anthony H. Cordesman’s Iraq’s Military Forces: 1988-1993 the conventional strength of Iraq’s ground forces in 1990 had reached jaw dropping proportions. The army had a million soldiers (many equipped with Chinese-made Type 56 rifles) and between 5,700 and 6,700 tanks with an equal number of APCs. Unfortunately, raw numbers meant little against the sheer strength of the Coalition. 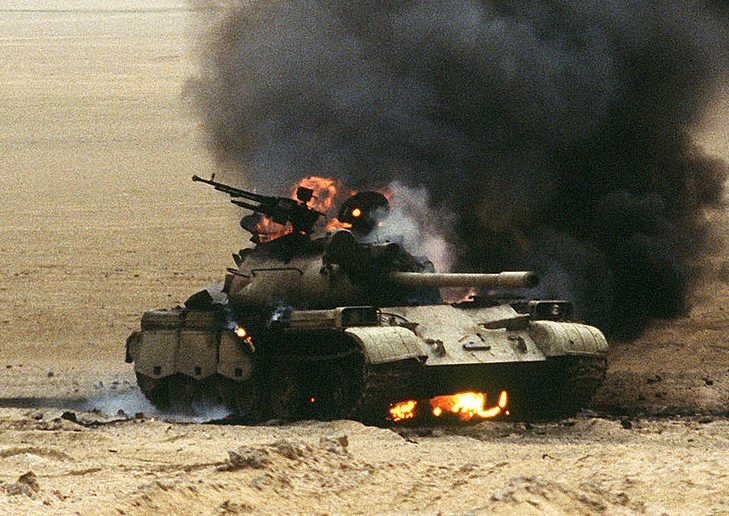 Cordesman cites the US military’s assessment of Iraqi losses by February 1991 revealing an estimated 3,196 tanks destroyed in the Kuwaiti desert. 10 years later though, as another US-led Coalition geared for invading Iraq, the best estimates of Saddam’s armored fleet reached 3,000 tanks! The figures pre-Operation Iraqi Freedom always mentioned enemy tanks were aging T-55’s and Type 59’s with several hundred T-72M’s among them. Still, the Pentagon never released a detailed inventory of Iraqi armor after 2003 so it’s impossible to ascertain how many of which models were left to defend Saddam’s doomed regime. Between the figures collected by SIPRI 30 years ago and other open sources on Iraqi tank strength circa the Gulf War, Iraq did amass at least 5,000 tanks and 4,000 were supplied by the Soviet Union and its allies. Testing the arithmetic now, aside from the 4,000 Soviet tanks (T-55, T-62, T-72M) Iraq purchased it added at least 1,300 Chinese tanks (Type 59 and Type 69) between 1982 and 1988. This totals 5,300 tanks and almost matches the CSIS’ estimated figure of 5,700 tanks by 1990, with the difference probably comprising French AMX-30B and captured Iranian Chieftain tanks. If the inflated figure of 6,700 tanks is used though, it leaves a yawning 1,400 tanks unaccounted for. Herein lies a conundrum. In the face of dubious records, how many tanks did the Iraqi army truthfully field by 1991? If SIPRI’s data at the time was incomplete and Iraq ordered 1,000 Type 59 tanks and 2,000 Type 69 tanks in 1982, then China was living up to its reputation as a world-class battle tank exporter. But the hard evidence of its gargantuan tank deal with Iraq may never be found. If this seems like a total waste of money, recall how Iraq financed a ballistic missile program and nuclear energy research out of its own pocket, with dismal results for both. No wonder Saddam’s biggest headache after the pointless war with Iran were billions of dollars in unpaid loans. ← What Happened During IQDEX 2019?